AAs a pianist and teacher to younger students, I cannot overstate the value of being able to make musical scores more approachable. When a pupil comes into the lesson without having rehearsed a piece, it is often an issue of confidence – the task at hand just seemed too daunting. Thus, my role becomes that of a diplomat between student and score. Tomplay assumes this job of making scores understandable, thereby leaving me to focus on my real task: the student’s technique. It really is startling how Tomplay has made every single aspect of learning a new piece easier – using the loop function to make use of the age-old bar-by-bar practice technique, and simplifying orchestral scores down to their melodic core. To witness an app such as Tomplay modernize the way we teach children music confirms my general faith in technology as progress. Outside of my teaching profession, I have also found good use in Tomplay as a source of notated music in my own personal practice – if the library is updated in the future with further scores, I could wholly imagine replacing my current bookshelf full of scores with a simpler, much lighter Tomplay library. 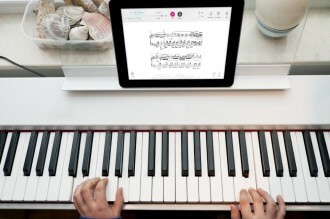 While there are currently quite a few good services providing sheet music for PCs and tablets online, it is exciting to see the possibilities of live recordings accompanying sheet music, and could allow for real, in-depth rehearsals of upcoming concertos without the unpractical need to be in the room with the orchestra. However, I see this mainly as a future possibility, given that the concertos I will be playing are not currently available on the service. Despite slight shortcomings in the range of scores available, Tomplay currently boasts over 3,000 scores adding new ones weekly, and there are definitely no faults to find in the intricate live recordings accompanying the scores. As an occasional user of the notation software Sibelius, my ears rejoice at the sound of live instruments – and no more tinny MIDI – accompanying my favorite pieces. I would love to be able to turn off the metronome count-in when looping one or two bars. While I understand the principal of a count-in, I would prefer to be able to continuously repeat a tricky phrase without pause. This is also an issue I encountered with younger students, given that I often use the technique of repeating a bar over and over again – both my and their attention span seemed to wane after multiple count-ins. The idea of simplifying orchestral scores down to the core melody necessary to play with the song is ingenious, and even altered my perception of some pieces, although I think it could be good to have the option to view entire orchestral partitions if one desires. It is equally a lovely touch to be able to choose the accompaniment (violin+piano, only piano), essentially switching between different facets of the same piece, thereby exploring the intricacies of the music. The area I am most impressed by however is the sheer sense of passion and thought that has gone into the making of the recordings and scores. One often has a sense of money-grabbing intrusion with apps that presume to make some sort of daily task or hobby easier to master, and presumably these apps are also often conceived by start-ups consisting of IT wizards and LSE economics masterminds. 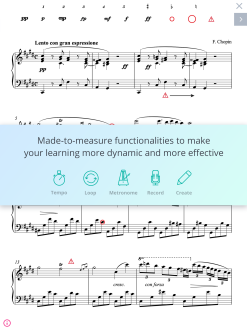 Tomplay disassociates itself from these self-help apps, and smacks of a real passion for musical notation and arrangement. The first, and lasting impression here is that Tomplay has successfully sought to cater to every crowd, from the beginner to the professional accompanist and soloist. Be it the professional’s simple need for an automatic page-turning device – and I can’t count the number of times I’ve desperately needed to find a fellow professional to turn my pages during a concert – or the beginner’s need for a friendly introduction between notation and produced sound, Tomplay seeks to make every musician’s life a little easier. And I can see this endeavor succeeding, if they manage to secure the licenses and put in the effort to adapt as many pieces as possible for the app. Tomplay has set itself a huge task in adapting and recording live orchestration for their app, but this is a truly special piece of software, and one that could shift perception to make what many consider to be ‘old’ music new again. Tomplay is available for Mac and PC, as well as a standalone free iPad app. Harvey Grant is a featured writer for Dotted Music. He is currently completing studies in Music at Goldsmiths University of London and works as a piano teacher.